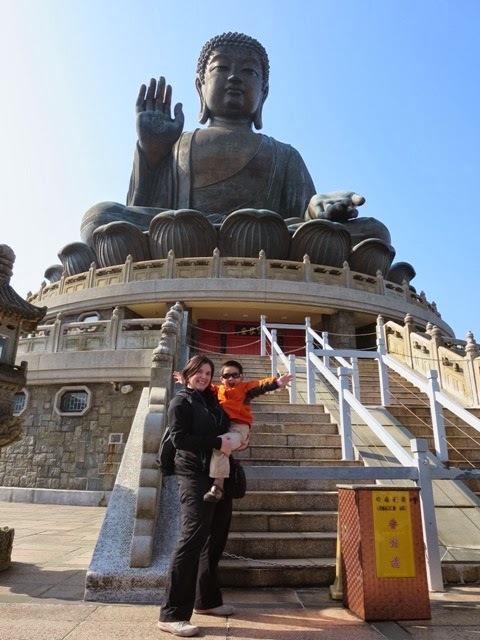 B had read about the Big Buddha (the Tian Tan Buddha statue) in his book Sasha Visits Hong Kong and had specifically requested we visit on our recent trip to Hong Kong. 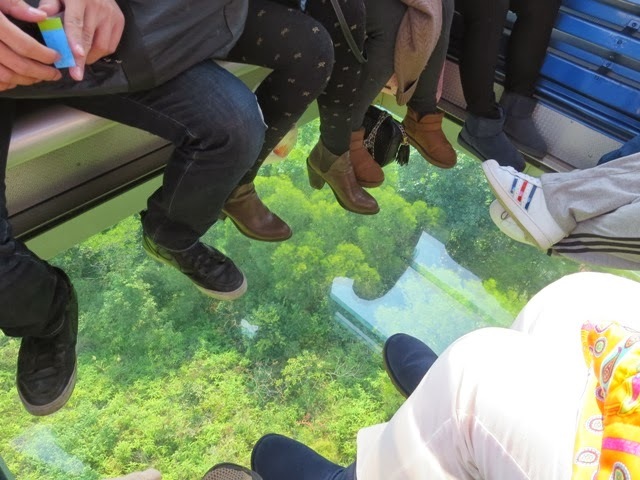 The most convenient way to access the Big Buddha is via the MTR then the Ngong Ping 360 cable car, a 5.7 km, 25-minute cable car journey from the Tung Chung MTR station to Ngong Ping village at the base of the steps leading up to the Buddha. If your little ones are fans of airports, the cable car affords a bird's eye view of Hong Kong's international airport. I arranged cable car tickets in advance via http://www.np360.com.hk/en/ which got us into a shorter ticket line on a busy day. Since our visit, the website has enabled online ticket sales allowing you to purchase and print tickets in advance and skip the ticketing line altogether. I chose to purchase 1+1 tickets, which involved riding in a Crystal Cabin (with see-through floor) on the way to the Buddha, and riding a Standard Cabin on the return journey. Taking the Crystal Cabin at least one way is a must-do for anyone who isn't terrified of heights and the views were fantastic. 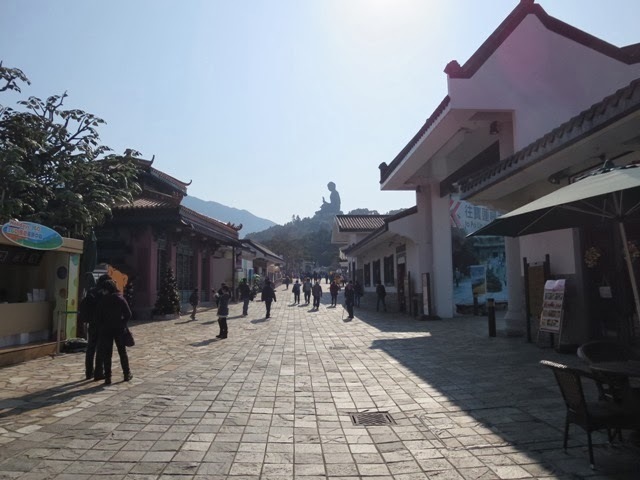 When you get off the cable car, you need to walk through the Ngong Ping 'village' to get to the base of the Big Buddha. The village is full of souvenir shops, restaurants, tidy washrooms, plus a 7-11 which is handy for picking up water and/or snacks. I wondered whether or not to bring along a stroller, but am I ever glad I did. It is a bit of a walk from the cable car to the base of the steps up to the Big Buddha, and with B's 4 yr old little legs and hot sun, I would have ended up having to carry him on the return journey otherwise. Our handy Uppa Baby G-Luxe stroller fit nicely under the seat in the cable car and we parked it at the base of the steps before proceeding up. 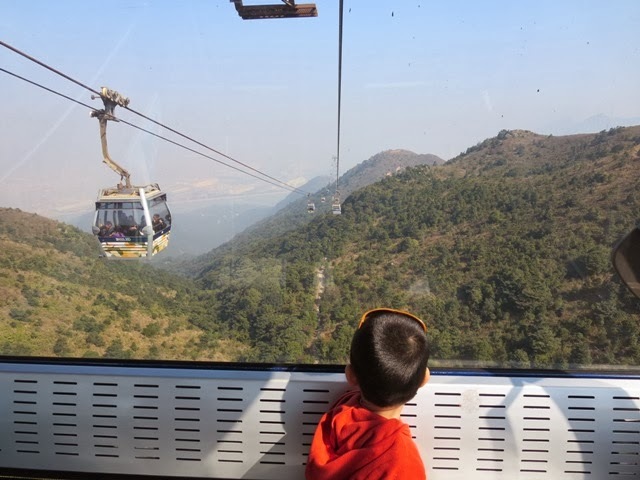 Take the MTR to the end of the orange Tung Chung line, and from there, the easiest way to access the Buddha is via the Ngong Ping 360 Cable Car. You can buy them Ngong Ping 360 cable car lower terminus or online in advance at http://www.np360.com.hk/en/. 1+1 tickets (Crystal cabin to the Buddha, return journey via Standard cabin) are $210 HK per adult, $135 HK for kids aged 3-11 and $165 HK for seniors. For more reading about this scenic spot, check out http://www.dangerous-business.com/2014/02/lantau-island-green-escape-hong-kong/. I discovered your site while we were in Hong Kong and attempting to get up to the Big Buddha —so,exceptionally accommodating!This is simply a note of speedy much appreciated.Additionally to say that the cable car ride up,while pricey, was totally worth the trouble for us-with-powerless tummies and that the sustenance in the Po Lin Monastery's cafeteria was a portion of the best veggie stuff we've ever had.I blogged about the experience yet from a to a degree alternate point of view.Simply needed to recognize how accommodating your notes and comments had been! Buddhists believe in reincarnation and the wheel of life in a comparable way to Hindus. They also believe that this cycle of life, death and rebirth can be broken by achieving enlightenment. Enlightenment can be achieved by adherence to the Four Noble Truths.